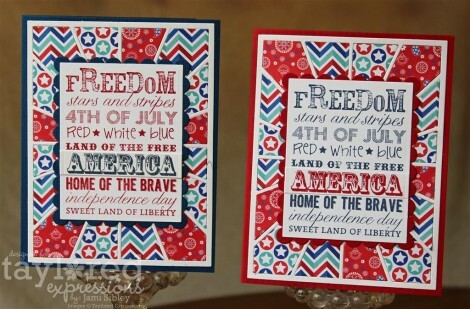 This first pair, was my first idea with these – showcasing the Graphic Greeting Patriotic A la Carte Stamp die cut with Spellbinders rectangle and scallop rectangle dies. I’m not going to lie, it was a little fussy putting these 3 backgrounds together. It wasn’t at all difficult, just a little tedious, but well-worth it. This die really gives a dynamite result! 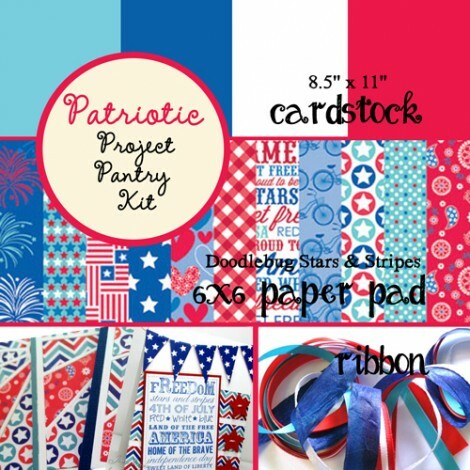 Have you seen the samples this week? Oh my! Die cut 3 Ray of Sunshine frames from a coordinating or neutral cardstock. I used white. lay out your 3 cardbases with frames side by side near your die cutting machine. 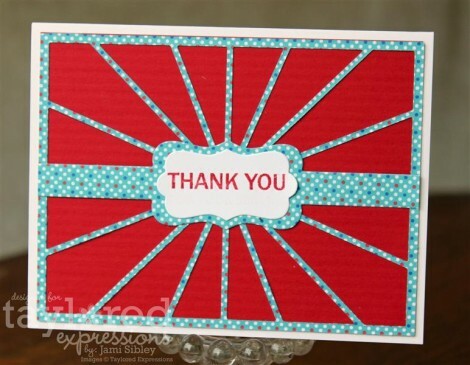 Die cut your first patterned paper with the cutting plate and place the pieces in all 3 frames. Alternating the spots, leaving 2 blank after each one. Do not adhere them at this point. Repeat with the other two patterns of paper. When you get to the end you will have teo patterns next to each other. Simply trade around that last piece among the 3 cards. This is why you did not want to adhere as you went. Now you are ready to adhere. I used tweezers to handle the little insert pieces and Tombow Mono Multi. For the card above, I used a sentiment from Labels of Love with the Band It Die and some Rouge Glitter Tape. At church we put on a BIG patriotic musical and country fair event at the end of June. It takes a huge team effort, so I thought these would make great thank you notes for the Pastor to send all the team leaders. Here’s another simple Thank You. 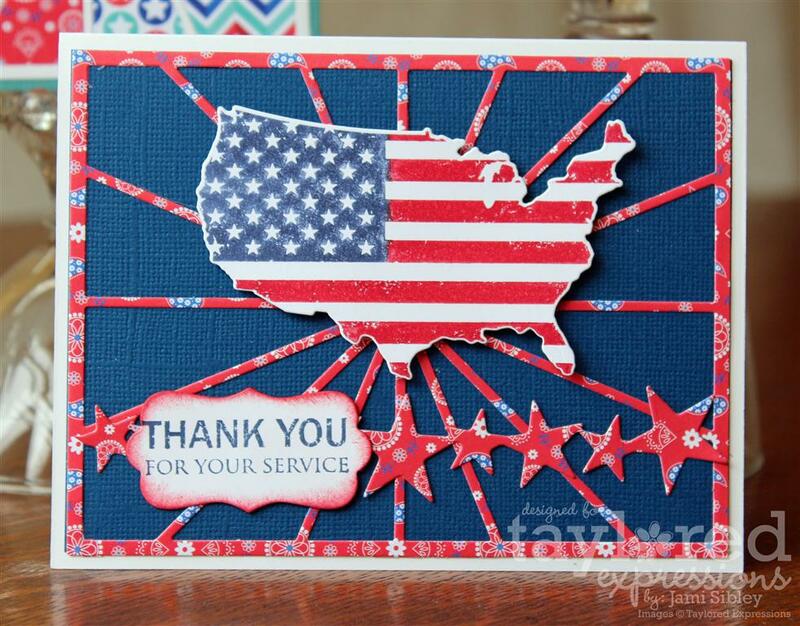 This sentiment is from the Stars & Stripes petite set. More of that set below. And finally, here is the last card which features Stars & Stripes and comes with this awesome die of the USA! I colored the stamp with SU markers and then die cut it. The border is Reach for the Stars and the sentiment once again uses the Band It die. Oh my gosh – I really love this Project Pantry! 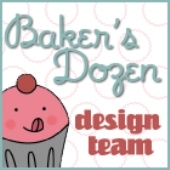 In fact, I’m considering ordering another one, even though I’m no where near done with the first one! Once I got done with this set, I had so many other ideas! Thanks for stopping by! Happy Shopping!! WOW WOW WOW! This is an explosion of awesomeness! FIVE projects? Are you kidding me? All of them are fab and super bright. Thanks for the tips about using the rays. I just guessed at mine….LOL. Love your post. 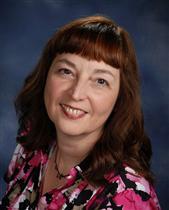 Have a happy release day Jami! Wow! 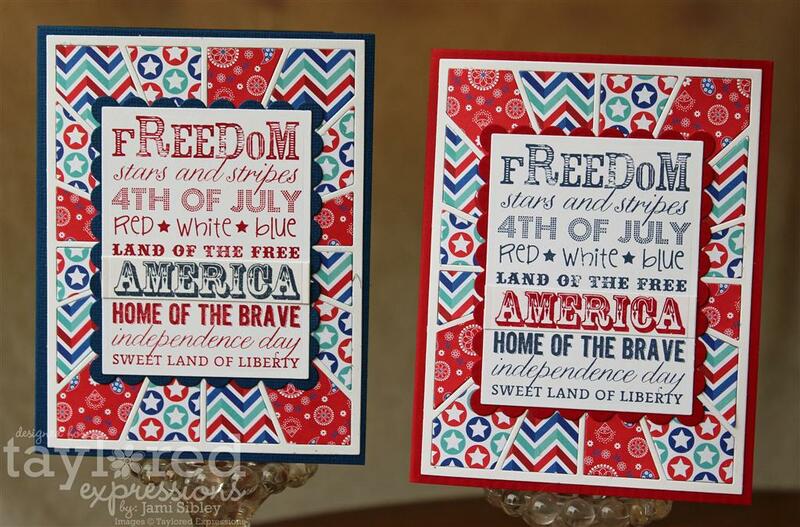 Wonderful cards, Jami! Don’t you just love this cutting plate?! Love your mixed patterned rays – such a cool effect and well worth the tedious steps! 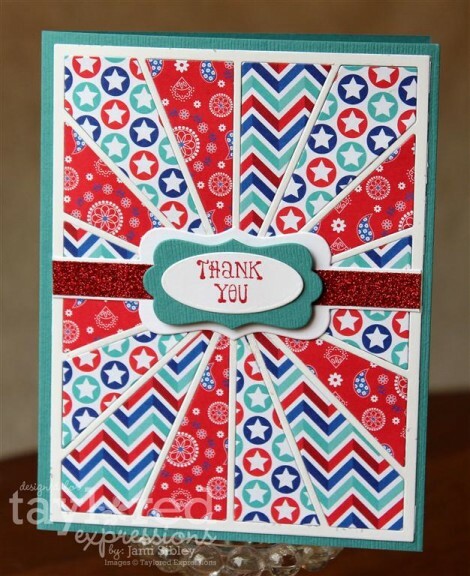 I love the paper pieced “quilted” look of your cards–very effective.